Now that the state budget is done, state legislators in Albany will turn their attention to other policy matters, including whether to amend section 50-a of the public officers law. That clause has figured prominently in the debate over whether the de Blasio administration is as transparent as it could be. The administration first used a newly restrictive interpretation of the law to justify withholding police disciplinary records, then—after years of criticism—offered to release more information, only to face and lose a suit by the police officers’ union, which argued that the mayor’s first interpretation was the right one. Now some Democratic lawmakers will try to change the statute itself. The dispute over police records is just one element in a larger argument. Since taking office in 2014, Mayor de Blasio says, he has offered unprecedented openness and gotten nothing but grief for it. His Campaign for One New York nonprofit released the identities of donors, something it didn’t have to do; that information allowed the press to write stories suggesting possible quid pro quo arrangements. De Blasio also voluntarily lists lobbyists he meets with. He created a FOIL tracker to facilitate better sharing of public information released via the Freedom of Information Law. But the mayor also tried to shield records from release by claiming his consultants were “agents of the city” and failed to release some key emails under FOIL; they only emerged in a later court case. As City Limits has reported, even as de Blasio has aggressively expanded the city’s budget, workforce and program portfolio, the offices that process FOIL requests remain poorly staffed. Now the mayor is getting grief on a different transparency question – not involving records, but meetings. In two prominent policy discussions over the past few months, the city has operated advisory panels whose meetings have been shielded from public view. Last fall, the City Council passed a law to create a task force on school siting to identify opportunities for new school construction or the leasing of space for schools. The panel has only met once so far, but that meeting was closed to the public. That angered long-time school-crowding watchdog Leonie Haimson, who sought legal advice on whether the city had a right to close the doors. Comptroller Scott Stringer has asked the DOE to hold the siting task force meetings openly. The city’s Department of Education (DOE) previously had resisted opening School Leadership Team meetings to the public, but they are now open. 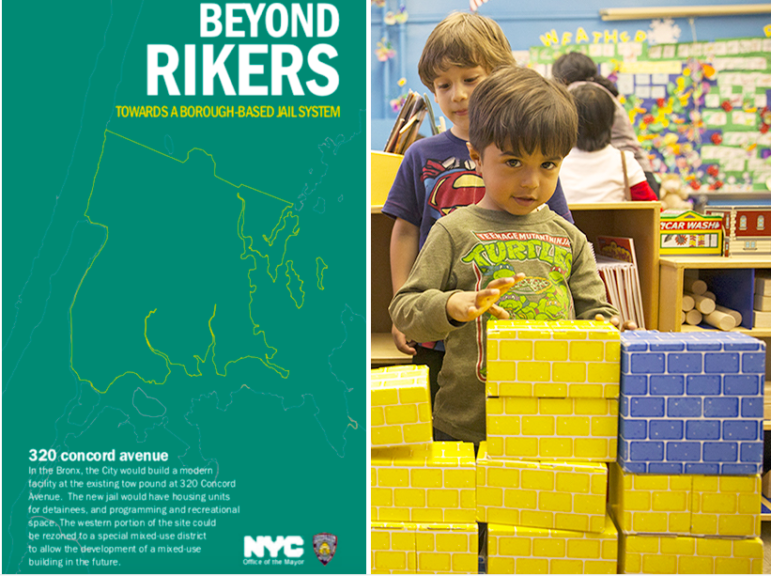 Separately, as it moved toward formally proposing four borough jails as part of the effort to close the jails on Rikers Island, the city created Neighborhood Advisory Councils of local stakeholders. But the press was barred from the Councils’ meetings. At a briefing last month, administration staffers were asked about this decision. Unlike the school siting taskforce, the NACs were not created by law, don’t have a specific membership and aren’t charged with a particular duty, so it’s possible they’d not fall under the open meetings law—although that wouldn’t prevent the administration from voluntarily opening them. In an ironic twist, when reporters at the briefing asked who had decided that the NAC meetings would be behind closed doors, a City Hall staffer first resisted answering that question when cameras were rolling, then said only that “we decided it was the best process,” before promising to come back with more detail on who “we” was. Speaking for the Manhattan N.A.C. meetings as an “invited” and “privileged” attendee , my observations were that regarding this lame excuse for barring press (and no tape recording) , the only person who shared a well rehearsed “bio” and experience was Vidal Guzmann from Just Leadership – a well funded national lobbying firm – hardly a neighborhood representative, in fact quite the opposite. That seat and that precious time could have been occupied by an actual resident / business owner / stakeholder , and not used to regurgitate the same information Just Leadership has had the infinite opportunities to reiterate privately to the politicians, and to the Mayor and to the community boards. This redundancy is unwelcome in this format which was wholly contrived and controlled by The Mayor’s employees. I call FOUL. If you don’t want to share something with the people who are not there but follow the media, then don’t share it. Nothing public is private. As a participant on the Brooklyn “Borough-Based Jail System” NAC, I asked the City to make its presentations and minutes available to the public and it did so. Although not completely current, those documents are online at https://rikers.cityofnewyork.us/nyc-borough-based-jails/nac-meeting-materials/. Not the same as being in the room, but a certain level of transparency.